Who’d have thought that they would find a venue generally acknowledged as being one of Bristol’s finest restaurants nestled in the back streets of Montpelier? Bells’ sleek, smart exterior seemed completely at odds with the garish lights of the Thali Cafe across the road. Smartly dressed couples sat at tables by the window while guys in hoodies and carrying pizza boxes and beer walked past just outside. It really was like stepping into a completely different world when we walked through the door…and I loved it. Formerly an old grocer’s shop, Bell’s is divided into three intimate dining areas. If possible, I’d suggest sitting in the front room rather than the more plainly decorated back rooms. Decked out with a quirky assortment of objects such as old meat grinders and baskets of fruit and vegetables, the restaurant feels less like a fine dining establishment and more like a French bistro – and with the relaxed, un-stuffy atmosphere to match. The incongruity continues when the food is served, with original and modern food at odds with the more traditional and down to earth environment. Armed with vouchers for deals from the LivingSocial site, my three fellow diners and I were all there for the tasting menu, and despite the evening lasting a good three hours, the atmosphere, food and company meant that the evening flew by. An amuse-bouche of squash velouté topped with a cumin foam and served alongside a blue cheese gougère kicked off the evening, and the arrival of the bread basket certainly perked up the bread-obsessed blogger amongst our group, who managed to sample the olive tapenade focaccia, raisin and walnut bread and sourdough over the course of the evening, omitting only the mini French baguettes. 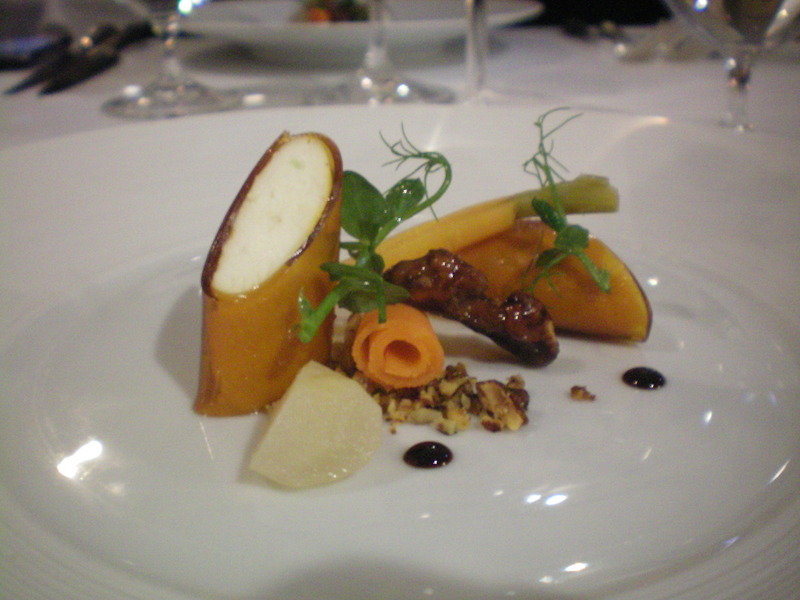 The purpose of a tasting menu is to expose diners to as much of a variety as possible – and is an opportunity for the chefs to demonstrate their abilities. Mission accomplished. Our menu took us on a journey through a variety of ingredients, flavours and textures, with some more traditional combinations and others more innovative. Wicks himself wasn’t in the kitchen on the evening that we went, but he’d described chef Alex as “the best number 2 I have ever had”, so we knew we were in safe hands. Delicately presented goats’ cheese cannelloni with walnut and pickled winter salad was a great exercise in combining flavours and textures, while the second course of a perfectly cooked scallop, vichysoisse, confit potato and a smoked haddock foam was one of the less complicated dishes of the night, and also one of the tastiest. 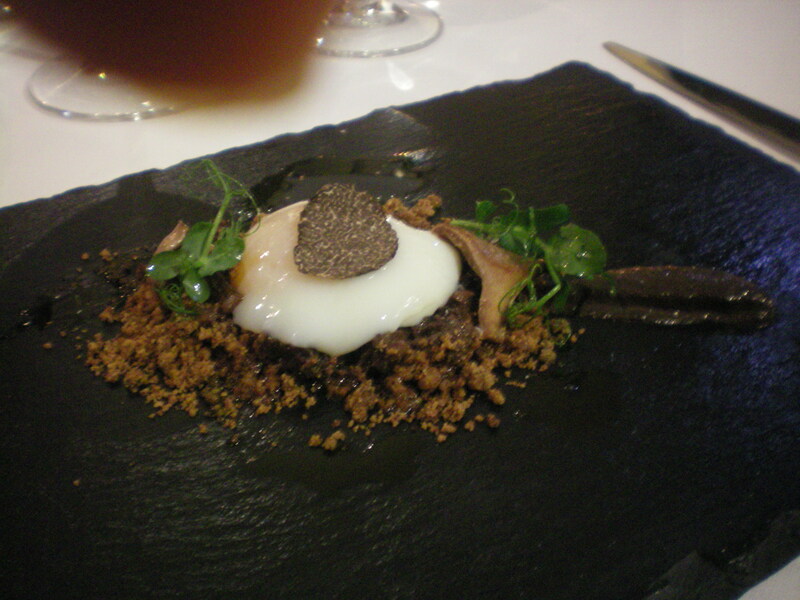 A hen egg, poached for two hours and served with wild mushrooms and a truffle mousse was fantastically earthy and full of flavour, but possibly a little too fussy. 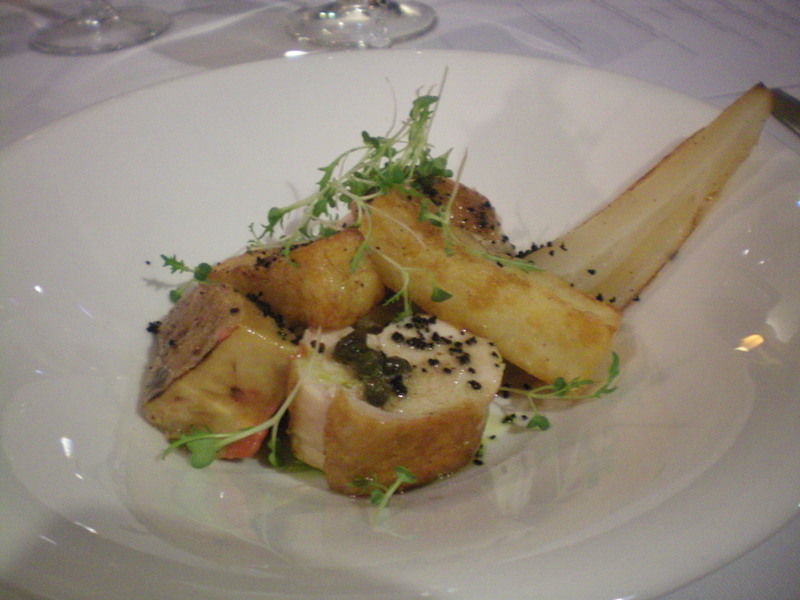 The following course, however, was one of my favourites: Perigord truffle-poached chicken served with perfectly cooked chips, endive, foie gras (although a little underdone) and a caper dressing. 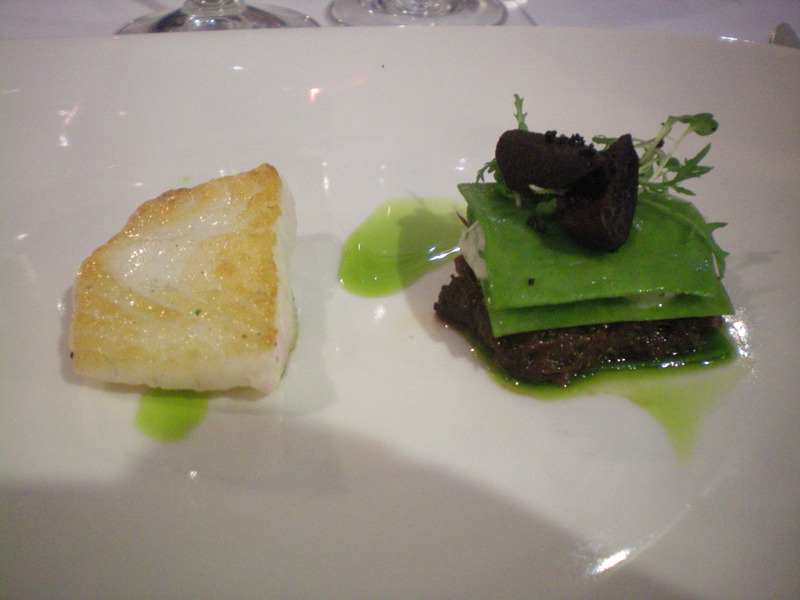 Brill served with an oxtail ragout and a sea purslane, salsify and parsley lasagne followed…and full credit to the staff on this course. We only remembered to tell them after the amuse-bouche that one of our party did not eat beef, and they were more than happy to substitute the ragout with a square of pork belly for her instead. The ragout was delicious, very rich and really complementing the slight sweetness of the fish…which was unfortunately a little overcooked. Our pre-dessert of a bright green pine liqueur topped with a pine foam was delicious, but with two non-drinkers at the table (and the other two barely drinking) we struggled to finish it. 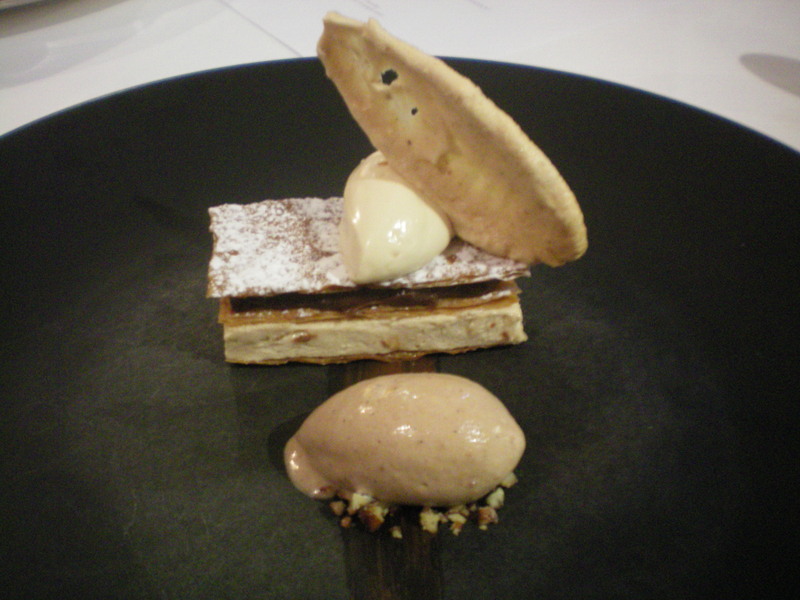 Onto dessert, layered sheets of very fine pastry encasing a praline parfait and a rich chocolate ganache, served with chocolate and salted caramel ice creams and a thin meringue. Coffees were served with a selection of macaroons: raspberry jam, green tea and chocolate and hibiscus, with the green tea variety definitely the most popular amongst our table. At £47.50 per head for the tasting menu (and another £37.50 for the optional wine flight), Bell’s may not be a venue for everyday dining, but the value for money is a given: not just for the food, but for the entire experience. 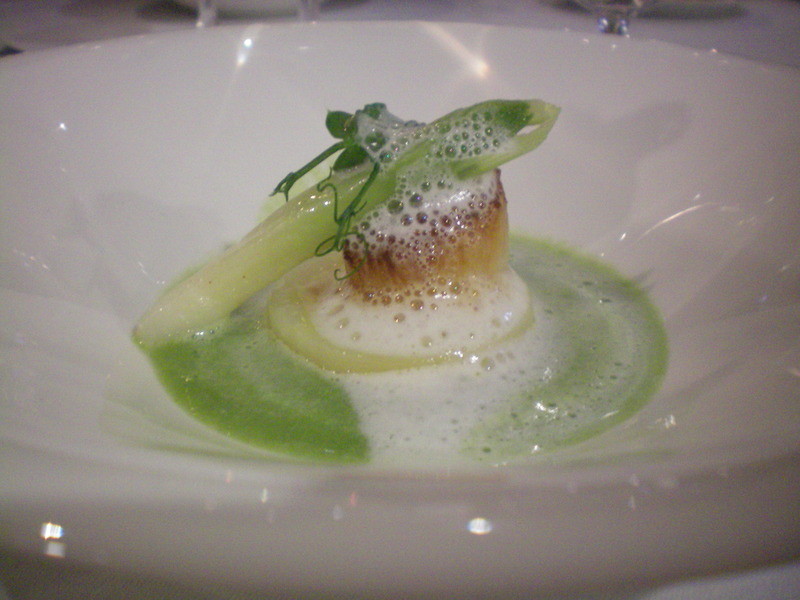 I’ll definitely be heading back to give the à la carte menu a try. Thanks to Chris and the team for a very enjoyable evening! Nicely detailed and informative article, Em. It's made me hungry again! Really looking forward to going there myself now. I can't actually believe this comment…. Idiot! Great blog, I am dying to go back to Bell's!! Wow, who made you the god of the interwebs Andrew? Andrew Sartain's comments are very surprising. Firstly for their unprovoked and unnecessary venom. Secondly, for the lack of basic courtesy and and vulgarity of the language used (was he drunk when posting?). But, most importantly, I ask myself, how does someone aspiring to work in the food industry have such a basic understanding of the dynamics of retailing? Some friendly advice to you, Andrew: you are trading in a community where relationships are important. People have to want to buy from you, not just because you have a product or service they require, but because they trust your integrity and adherence to basic human and social values. You appear to have no concept or understanding of these. The cure would seem to lie somewhere between the extremes of basic training and radical psychotherapy. Did you think, when posting your ignorant comments, of the effect your ignorant post would have on your own business? I am not surprised to learn you are in the mushroom business. Have a nice day! I feel the mushroom business is perfectly suited to Andrew because (as his comments have demonstrated) like the mushrooms he is selling, he clearly lives in the dark and is fed on excrement. I would ask what makes anyone qualified to be a critic? is there courses for this at university if there is, I did miss it. By purchasing something you are entitled to give your direct opinion in which Bristolbites has, its like giving your opinion on a car you purchased, no difference…. I would say if you feel strongly about bloggers etc you take your own advice and not read them! Couldn't agree more with Matthew! Surely the whole point of a blog is simply to give your opinion, in exactly the same way that Andrew is able to voice his. Andrew, everyone is entitled to their opinions. That includes the writer of this blog, and you. But there is absolutely no need to be so abusive in your comments – especially when this blogger has actually been very complimentary about Bells. Hmmm… constructive criticism is always welcome on blogs. Un-constructive and absusive criticism, however, helps no-one. Many Bristol-based food reviewers as well as businesses (including restaurants) follow Emily's blog so this doesn't exactly promote your Wild Food Larder, which I note trades at my local Redland Farmers Market. Needless to say, I will be avoiding your stall at all costs on my next visit. PS. Some 'constructive criticism for you now; your own website would look far more professional if you used a spelling and grammar checker prior to publishing content. Wow Andrew. Bristol Bites could have done you and your business a world of good with some great publicity. Thanks Bristol Bites I am now really looking forward to my upcoming meal at Bells Diner. Surely the readers of a blog decide whether the person writing the blog is a credible source. I personally would prefer to read a review off somewhere such as Bristol Bites, than somewhere that has alternative motives or a bias. This was another very good write up. Shame I can't afford to visit Bells. Going off Andrew's rant – what gives him the "right" to have a website telling people what he does, does he have a new media degree? Or other such relevant material. Or is he passionate about what he does, and writes about it in a manner his readers can relate to? Thank you for the write up of Bells, I look forward to reading more. Andrew – anyone has the right to be a 'food critic' – whether they're a food blogger or not. If you go out for a meal that you hated and you told friends about it in the pub, it's exactly the same thing, only via a different medium. Everyone's entitled to express an opinion. What qualifies me to write up my experience at Bells is exactly that: MY experience. I have no doubt that other people have different opinions to me, but I'm not forcing anyone to agree with me – or, indeed, to even read my write-up. That's up to them. I'm not claiming to be an amazing restaurant critic. I've not got lofty aspirations to be the next AA Gill or Jay Rayner. All I'm aiming to do is to write about my experiences of food-related stuff in Bristol, be that meals in restaurants, profiles of local businesses or events happening in and around the city. It's up to you whether you read them – and, if you do, whether you agree – but I don't think there's any need for abusive comments. There is no need for abusive comments – as said, everyone is a critic -as long as they have experienced something then they have the right to criticise. You are not being forced to read this and if you don't like it then you know where the door is. There's no need for abuse and nasty comments – are you upset that you haven't had a fab review yet? Your comment stinks of someone sulking. Blogging food critic. Market stall holder. But which is better? There’s only one way to find out… food fight! Great review, well written and amazingly you didn’t feel the need to swear! Emily, a great post! I have wanted to go Bells Diner for ages. Now it's definitely on my 'to go to this year asap' list! Thanks for inspiring me. I thoroughly enjoyed reading this review. I love food and exploring new restaurants and local haunts in Bristol. I was looking forward to trying Bell's Diner, however after reading the appauling response you have received I have decided to give it a miss. Will look forward to reading your future reviews. Hi Lucy, thanks for the comment. Just keen to clarify that the poster of the abusive comment has nothing to do with Bells Diner in any professional capacity, so please don't let this put you off. I'd definitely recommend a visit. They do a blumming wicked fried breakfast too innit? I knows, cos I've had loads of fry ups, me. I think I was there the same night as you in Bells Diner. Were you a table of 4? Nice review – I still didn't get round to doing mine. Hello Rosie – we were indeed a table of four. Which table were you? Thanks for the comment – did you enjoy your meal there? Found your blog via Dan's (Essex Eating), the Star and Dove review with ranty comments from Hacked Off Helen! Regarding Andrew Sartain, not sure what provoked his ire but I'd ignore him, as you no doubt are. I used to interact with him on twitter for short period, but quickly got fed up of his random, completely unprovoked attacks full of venom and anger. Quite incomprehensible. I tried to ignore them for a while, wondering if perhaps this was beyond his control, Tourettes or some other such thing. In the end, I decided that it didn't matter what the cause was, I had no wish to continue interacting with such a character. It also put me off booking anything through his business, which I had been considering until that point. Own worse advertisement really. Thanks for the comment, Kavey! Having a read of your Bell's write up now, I'd be keen to go back and try out the a la carte menu, as we had a great time on our last visit!